“The demand for reclaimed wood products has been steadily increasing as consumers recognize and value the look, feel, functionality and cost of reused wood in products such as flooring, furniture, structural timbers and more. 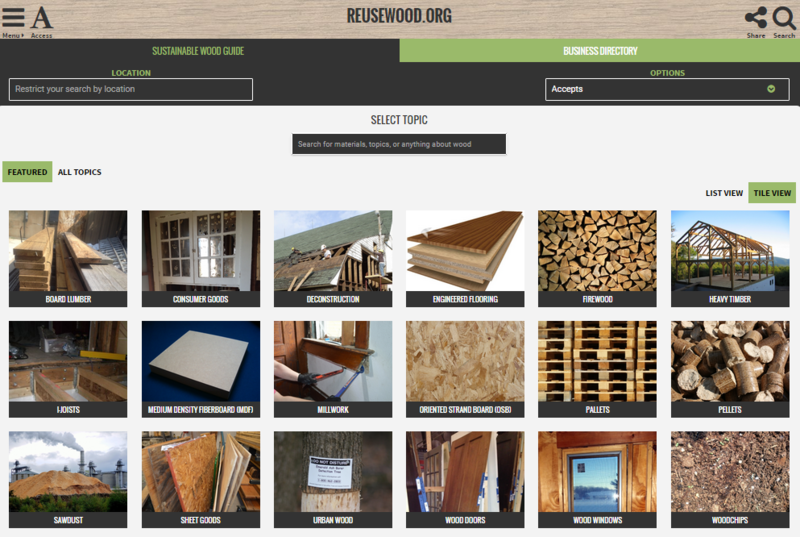 The North American Wood Reuse and Recycling Directory will connect demand and supply to ensure the continued growth of this reclaimed wood market, while simultaneously keeping thousands of tons of wood out of landfills,” said BMRA Executive Director Anne Nicklin. The business directory is accessible via both map and list, with easy sorting capabilities according to target categories (location, services provided, etc). Individual listing pages show the contact information, location and available services for each business. The sustainable wood guide includes useful information and articles on the different wood products and the opportunities for wood reuse or recycling.